Buying a diamond is a very personal experience. Diamonds can be bought to signify love, significant accomplishments, milestones in your life or that of a gift's recipient. Unlike when you buy clothing, electronics, or cars, the features of a diamond may not seem quite so obvious to you. We would like to change that. The more you know about your diamond jewelry, the more confident you will feel when making your diamond jewelry choices. Take a moment to learn more about the 4Cs and find out how they play an important role in making your diamond jewelry unique. The shape of the diamond is often confused with the cut. Choose the shape that you like based on your style and you cannot go wrong. The cut of a diamond determines its brilliance or sparkle. Each shape will be cut differently. Before a diamond is cut, the location of inclusions and flaws, the natural coloration, and the original shape of the rough stone are studied extensively. The stone facets are then mapped out and cut in a way that maximizes size, shape, and clarity. For optimal light performance, you will want a diamond that is cut neither too shallow nor too deep. Diamonds are graded based on the amount of color they do or do not possess. The scale runs from D (colorless) to Z (light yellow). An absolutely colorless diamond is rare and therefore very valuable. A diamond is distinguished by its natural characteristics, just as a person would be noted for her blue eyes or his brown hair. Notated as a diamond's clarity, these characteristics can be present on the surface (blemishes) or within the stone (inclusions). The clarity is judged by the number and types of these characteristics and is designated using a scale that runs from Fl, defined as flawless, to I3, defined as inclusions visible with the naked eye. A flawless diamond is truly rare. Flawless: No internal or external flaws. Internally Flawless: No internal flaws. Very, Very Slightly included: Very difficult to see inclusions with 10x magnification. Very Slightly Included: Inclusions are visible under 10x magnification to a skilled grader. Slightly Included: Inclusions are visible under 10x magnification and may be visible with the unaided eye. Included: Inclusions are visible with the unaided eye. The unit of measure used for the weight of a diamond is the carat. 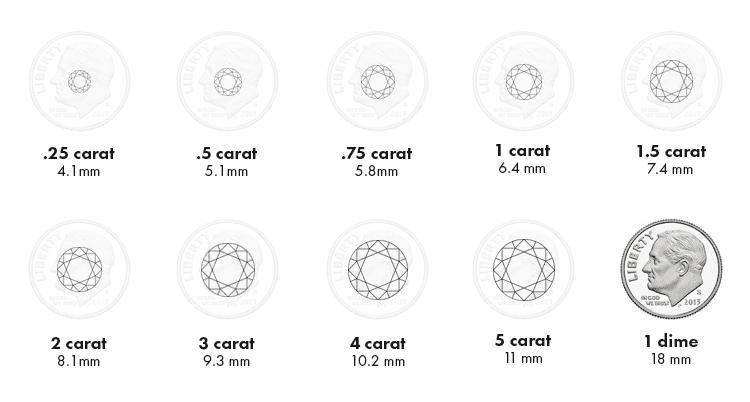 As a matter of reference, a carat is equivalent to .2 grams or .007 of an ounce. Carat weight can also be divided further by using points. There are 100 points in one carat. So a 1/4 (.25) carat stone can also be expressed as 25 points and mean exactly the same thing. When comparing two diamonds, please note that just because one is twice the carat weight of the other does not mean that it will appear to be twice the size.